Does the Covert surveillance of Julian Assange break international law? Craig Mackey QPM (Deputy Commissioner, Metropolitan Police Service): These are diplomatic premises.It is actually extremely difficult – I would suggest – under international law to do some of the things you infer or suggest in the way you asked the question. That is probably as far as I could go. In October 2015 the overt surveillance of Julian Assange outside the Ecuadorian Embassy in London by uniformed Metropolitan police officers was terminated after occurring costs of £13.2 million. The official explanation for the termination was given by the Metropolitan police as “no longer proportionate to commit officers to a permanent presence” and it was taken after “the MPS has discussed it with the Home Office and the Foreign and Commonwealth Office”. Yet, MetPol also confirmed that it “will deploy a number of overt and covert tactics to arrest him”. At the time the UK government was engaged in an adversarial legal process at a UN body against an action by Julian Assange’s legal team to have his detention declared arbitrary. This body was reaching the end of its deliberation at the time the Metropolitan Police was sitting down with the Home Office and the Foreign and Commonwealth Office to discuss the Assange surveillance costs and the UN ruling would have been eminent and predictable. During that meeting the decision was made to withdraw the uniform police officers. 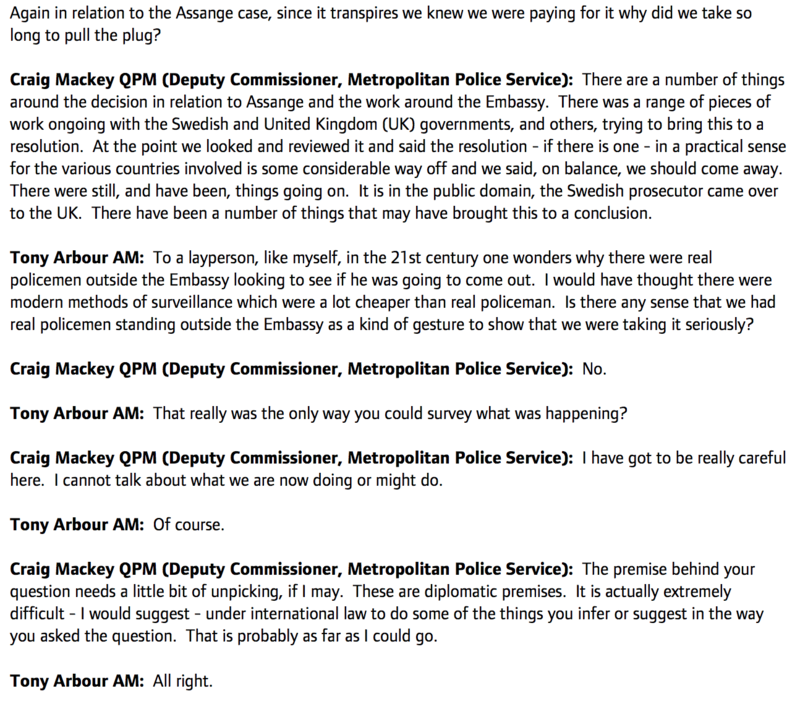 When a few weeks later, in December 2015, the UNWGAD reached its decision that Julian Assange was Arbitrarily Detained by the UK and Sweden the uniformed MetPol Offices had already been removed. When the UNWGAD ruling was published on 5th of February 2016, the world’s media turned their attention to the Ecuadorian Embassy and its balcony, from where a measured Assange declared: ‘How sweet it is!…this is a victory that cannot be denied’ the overt surveillance conducted by uniformed police was no where to be seen, the police presence, as a backdrop to the cameras had gone together with clear evidence of the full force of state power and repression. There was covert surveillance targeting Julian Assange and the Ecuadorian Embassy since the moment he entered it. 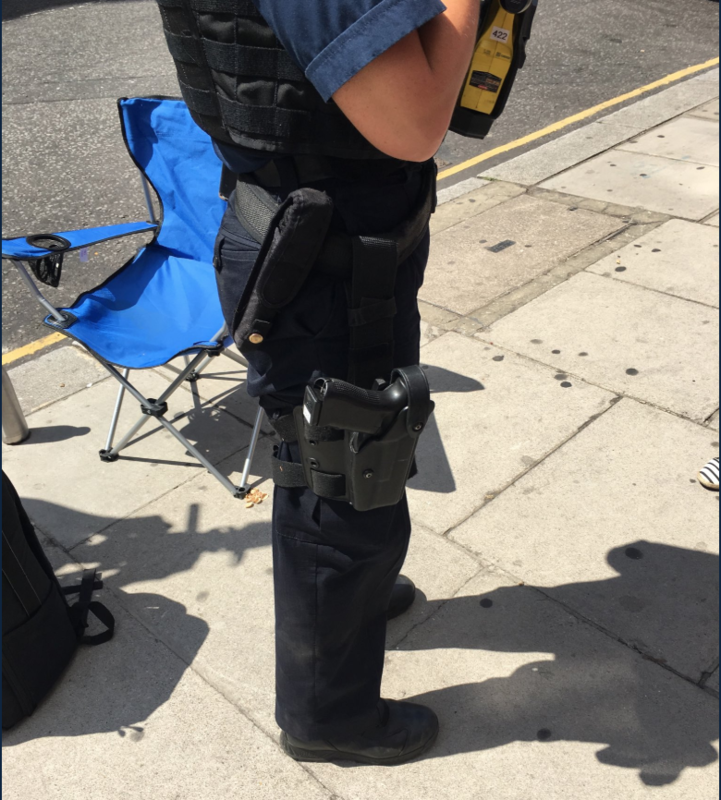 From the presence of a 2 metre long electronic intercept antenna stationed on top of a MetPol ‘mobile conference room’ parked at Hans Crescent to undercover police stationed at nearby buildings and robot surveillance cameras. Other units of state law enforcement have also been involved in this surveillance outside MetPol; as cost centres they are excluded from public scrutiny and therefore we cannot investigate them. The persistent secrecy regarding the public resources spent on the surveillance of Julian Assange and the Ecuadorian Embassy undermines the proper checks and balances of Mayor’s spending power. It is a failing of accountability when information in the public interest is kept secret by the London Mayor. It is also a failing of the London Assembly Members tasked to scrutinise public spending by the London Mayor. 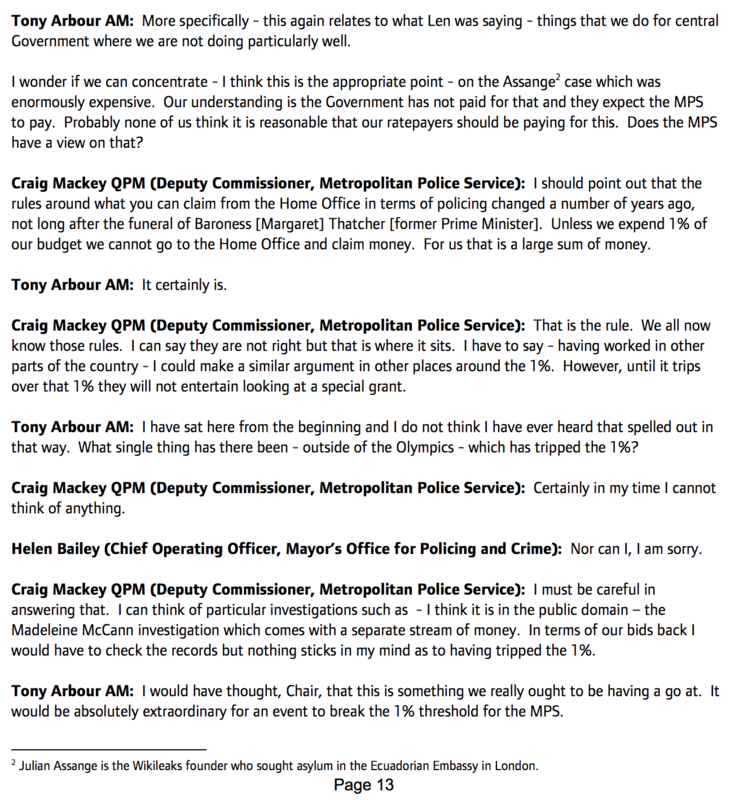 Such blatant lack of accountability and transparency in the matter raises questions about the motivation of hiding the costs including potential illegality of surveillance methods.
. MOPAC Supplement Minutes – Appendix 1 – Transcript of QA 22102015 1000 Police and Crime Committee and it has been archived here.
. “We are told that the Met cannot comment on the cost on any covert operations and are only able to offer limited information about any operational plans.” London Assembly member Unmesh Desai reply to my enquiry August 2017.